Burgos to Hontanas. The start of the Plains of Castille. First the city of Burgos redeemed itself somewhat. Although the new modern area around the old centre is vast and takes forever to penetrate, the old part and the magnificent cathedral are worthwhile. The deafening peal of the cathedral bells rang out as we left it after viewing the huge dome/spire from inside and what appeared to be a solid sliver cart. A very good nights sleep after the days excess walking and we were off in the dark through the streets peering into corners to spot the Camino marks (yellow arrows or blue signs or brass scallops in the pavement), the marking of the exit through the town was of better standard than the entrance and we eventually dropped off tarmac onto the familiar rough track with only 15 minutes of head torch use. The route out of the immediate environs seems to have been permanently diverted around motorway constructions with little consideration to the direction of foot travel of pilgrims and it took longer to reach a breakfast coffee stop than expected but shortly after that we climbed gently onto the 800m high plateau covered in stubble fields and rocks, in a chalky soil. It is very arid, if the rain in Spain falls mainly on the plain, it’s not at this time of year. We ramble on over the undulating plain, there is nothing to see but fields a herd of sheep in the distance grazing and being shepherded and a crow provide the only entertainment apart from mountain bikes which seem more popular than walking on this part of the Camino. The horizon is closer than it should be as we are on top of a huge upland, dropping very slowly in all directions. The world seems to have shrunk. Suddenly we see a vehicle passing 400m in front of us. There is a road crossing our path and signs for the albergue in Hontanos become more frequent (5€ for a bed). Suddenly a small valley opens up with houses and a church bell tower and our path drops down into it. We stop at a very clean smart looking bar and check in early getting the best beds by the window and power point. Talking later to some Irish pellegrinos we find this was a wise choice as the rather tumbledown municipal albergue 50m down the street was fumigated for fleas two days ago. Is it better to stay in a albergue that has been fumigated or one that hopefully doesn’t need it! This village is very rural, looking round the hillsides tractors almost outnumber inhabited houses. The key word is inhabited, a sizeable portion are disused and ruined while others next door are being repaired. The walls on the sides of the track down into the village look and probably are 1000 years old and may well be here in another 1000. A tough day, we started at the usual time having been fed a great meal the night before by the parish and the bar we were in (bar is parish rooms and centre of village and internet resource for local kids). Meet and chat with in the evening, a German psychologist, an Italian living in Barcelona and several others including the volunteer chef who is an agricultural engineer ?Spanish, a great crowd. We stumble around in the dark managing not to get off route this time and are accompanied by a “wee slip” of a Hungarian girl who wants to start early but does not want to travel on her own. This possibly translates to ‘I have not got a torch’ as she tags along behind us for the hour or so before dawn. She peels off as soon as it is light and we continue a significant ascent from the 800m start in Villambista to 1050 or so, it’s quite cold and we are walking quickly through pine forest on a large fire break track, but still don’t really warm up till we come down into San Juan de Ortega. The café is closed and opens probably in 15mins and as there is nothing else, we press on. At this point we know there is a spilt and a choice of routes to the city of Burgos, it is around 0900 and we have covered maybe 20km or so, our plan was to take the new route it possibly has an albergue at about another 10km but we cannot find the path and end up on the original route. In Ages where a possibly Irishman has set up a little café, we have 2 coffees and toast etc and buy some goat cheese. He suggests the local refugio but it is only around 1000 and we decide to go for broke and head for Burgos, another 20km. After topping another steep rise we see Burgos (a sizeable city) in the distance, it disappears as we descend again but didn’t look too far! About 3 hours later at 1400h we get to the new 6 story Albergue de Peregrinos in the city centre after walking through the extension being built to the airport, across an autoroute, through the commercial sector and a high rise residential suburb. Unlike most large towns there is not great signposting and few concessions to the Camino the cause once again of the city’s foundation. Eventually when we are within 1km of our destination the occasional yellow paint arrow gives way to the familiar bronze scallop shells, but at first these are almost obscured by public bench seats. Within a few hundred metres of the albergue, we catch up with the Hungarian girl from this morning. She must have overtaken us when we were having breakfast! We get beds and set out immediately to eat returning for a rest and washing about1600hrs. We must have a shorter day tomorrow as 42km in eight and a half hours is a bit silly. 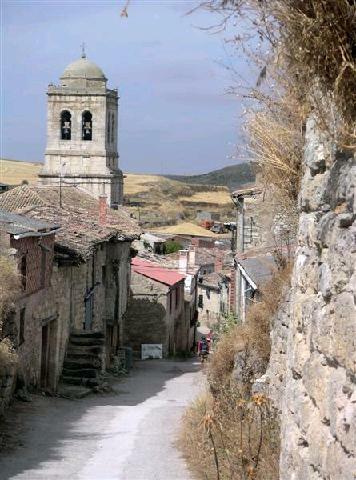 Santa Domingo de Calzada to Villambistia. Last night in Santa Domingo there was the third night of four of an outdoor local production of the life of St Domingo. This runs from 2200-2400hrs. We did not attend but it is preceded by a street procession past the hostel. We did watch this complete with horses and music on what may have been shawms or relatives thereof. We also climbed the bell tower (the highest in Rioja at 70 metres they seem very proud of this) for some very good views. But as usual it was up at 0515 and off after orange juice and a very large chocolate pastry purchased the previous evening. Next door to the albergue was a set of vending machines including a coffee machine labelled as for 24 hour use.Which 24 hours these were for we never found out as they were closed, so no coffee to start the day. The day went down hill from there as in the dark, navigating by headtorches, we took a wrong turn somewhere, adding 3km to our planned day. We were back on track after a 45min wander around the Spanish countryside and battling into the face of a strong head wind blowing threatening clouds over us which produced just enough rain to persuade Tim to put on his waterproof and then promptly stopped. The sun broke through briefly about 0830 and illuminated the stubble fields with some beautiful yellow light and a persistent rainbow ahead of us. After 4-5 hours of effort we reached Belorado and had a much needed coffee or two at the refugio/bar there (plenty of accommodation here but not yet travelled far enough. We reached Villambistia about 1200 and the bar/alberge we stay in tonight, just in time to watch Spain tie with China at basket ball in an early heat of the Olympics, much to the delight of the locals, as they had been trailing most of the game. We start early because the rest of the dormitory is rising around 0500. Out of the village by torchlight we see very few of them. We think that we are faster at getting going in the mornings, usually a litre of orange juice between us and whatever else we have like some dried apricots this morning and then we are off. Yesterday evening we met the man with two dogs and a shopping cart, he started in St Jean Pied de Porte, the two dogs (mother and baby) he has prevent him from staying in hostels and his gear for sleeping out and caring for his dogs prevent him carrying everything, so his solution a shopping cart . Not a trolley with wire basket but more like a golf caddy only bigger. He manhandles this over the Camino, most of this is easy but we have seen some rough bits that give mountain bikers pause for thought. The morning is cool and some cloud prevents the sun breaking through till around 1000. The way is at first over the undulating vineyards of Rioja, they go on for miles but we suppose all the good red wine must come from somewhere. The vineyards are gradually replaced by stubble fields from which a good corn harvest seems to have been gathered and the bales of straw are slowly being collected or gathered into piles in the fields. On our way through Najera we are stopped by 2 nuns who are cleaning the street. They have brushes and a rubbish bag and are picking up litter. They attempt to talk to us despite us obviously not understating much that is said to us, but one of them ends up blessing Tony before sending us on our way! Just after 0800h we reach Azotra where a bar is serving breakfast and pelegrinos plus a few locals are having coffee and breakfast. So do we. It is very welcome so we have two coffees each as well as the breakfast of toast, butter and jam. After 30km about 1145 we reach Santa Domingo. This is a classic, very old Spanish town, started in the 11th century by St Domingo, he must have been quite something. Having been refused entry into the priesthood because of illiteracy he become a hermit building his own hermitage. He recognised the need for hostels and the first hospital to assist the hordes of pilgrims trying to reach Compostella, so he built them! The town then formed around these and has probably the longest and best history of hospitality to pilgrims on the way. The rest of his life seems to have been devoted to bridge and road building along the route in this area, pretty good for a church reject. The hostel we are in is almost opposite the site of his initial hospital and is a great old building repaired in 1965 and now undergoing some expansion. The cathedral has an exhibition of religious art in the cloisters and a live cockerel and his mate live in a room in the roof! They are a symbol of the reputed miracle of the pilgrim who was framed for stealing (by a jealous rejected innkeeper’s daughter) and was hung, but still lived when his parents returned from Santiago. They petitioned the judge for his release and were told that there was less chance of his being alive than that the two fowl on his dinner table could fly, whereupon they did and the boy was released. The building we stay in is also the housing for the replacement birds for the cathedral. The whole town is a mix of many ages of buildings, side by side, and many are propped up and undergoing restoration, including an interesting bit of city wall. 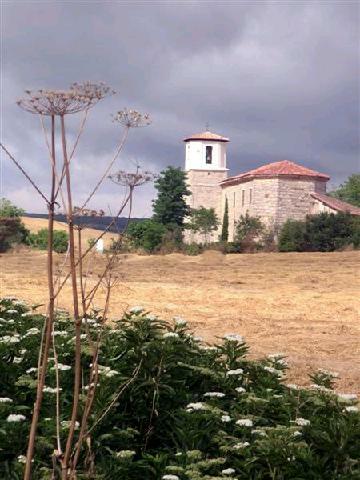 This is a town built for the Camino and is being restored in part by the current day activities of the Camino. Viana to Ventosa through Logrono. Not a good night, the combination of a large Spanish town and Saturday night seems to mean that quiet does not start until about 0100hrs. Since many peregrinos start the day at 0400hrs and today there was one, some what stereotypical Irishman who took over 30mins with a head torch to get his gear together in the dormitory at 0630 not a lot of sleep was to be had. Still we thought a quiet day into the big city, Logrono only 5 miles away. Even with a late start at 0730 we ambled across the river Ebro, crossing the border into the Rioja region and into the nearly asleep city at about 0830. The church of Santiago St James is certainly impressive, built in the 16th century and with the massive stone carving of St James Matamoros over the main doors. It is this incarnation of St James, Matamoros (slayer of moors), who in Spanish folklore is credited with the stopping of the relentless tide of Muslim expansion northwards in Spain in the 10th century. The local government of Logrono has done a good job of preserving and making a trail of the Camino through the expanding suburbs of a fair-sized city and many of the local population were taking advantage of it early on a Sunday morning, running and cycling circuits that included part of it. We were met with many greetings of ’Bueno Camino’ even from those not (at this time) on their own way to Santiago. We stopped to buy bread and ham from one of the few open shops and since even at this hour there were queues of people outside two of the big hostels we passed, we decided to press on through the vast vineyards across the basin of the Ebro to the next town, Navarette was reached about 1115 and there was a sign in the main hostel saying full but not opening till 1400, we had a beer and thought that this town (with a lot of middle level accommodation heavily advertised may not be playing by the rules. With some misgivings we pressed on reaching the village of Ventosa, passing at least three Bodegas on the way at about 1230. This was a very good decision, the little Albergue here is one of the nicest we have been in. Clean, tiled, with a back garden with washing lines and a welcoming air, all that tired pilgrims could desire after 29 kms. Villamayor de Monjardin to Viana. Not as early a start as usual, the hostel is so small that Ralf, (the German tax inspector/guardian) and his colleague try to stop people getting up before 0600 and provide a breakfast from about 0615 to encourage this. It worked reasonably well and since we did not have to far to go today and it is no longer so hot by 1100hrs we were happy along with just about everyone else. No need for head torches as it was getting light enough by the time we left the village lights at 0645. The first few miles were a pleasant walk across undulating country as the light came up, illuminating the stubble fields and the distant Sierra da Cantabria with the cloud remaining hanging over them. We pass, get passed by and repass familiar faces over the morning, and find a bar open in Torres del Rio at 1000 for a quick coffee. Out intention was to stop in Los Arcos for the Pilgrim Festival (an excuse we think for a larger Saturday market), though perhaps with a fiesta in the evening, goes out the window as at 0845 as they were only just setting up stalls. We continue over fields with increasing olive and vine cultivation and see our first wild Agave (large prickly succulent), another sign of changing climate zones and finally top the crest of the valley basin of the river Ebro containing the city of Logrono in the province of Rioja. Here in Viana, 5 miles away and 100 metres higher, we are staying for tonight in a large town with a lot of building work on the side we enter as the construction of many new apartments is in progress. A large church with a wedding about to start, we see the bride arrive in a horse drawn open carriage and pass by the hostel in the side of the church to go to the one about a 100 metres down route attached to the ruins of the old church. There are about 70 beds here and the labelling of the 3 tier bunks is somewhat idiosyncratic, we have 12 and 18 and they are one above the other! Puenta la Reina to Villamayor de Monjardin. We got some food and had a light evening meal before an early bed, but in a large hostel of over 100 beds, there was an inevitable amount of noise and we did not sleep till around midnight. However we got up at 0530 as usual along with most of the rest of the hostel and there was a bit of a loose maul while getting everything together and out of the door. Down the main street well lit with streetlamps and over the old pilgrims bridge that gives the town its name. Over rough tracks across fields and some scrubland by at first by light from our head torches to Estella. The weeks across France with heavy packs and the High Pyrenees must have made us fitter than we realised, no one passes us but we overhaul a number of earlier starters, the only ones who keep our pace are an elderly Spanish woman who talks as fast as she walks and doesn’t seem to mind we don’t understand a word, and later in the day a French man with the same advantage as ourselves as he has walked from his home in Strasbourg. Estella is fair sized town with at least two hostels and various other options but it is not even 1000h when after 12 miles we arrive in Estella. This is a big modern town, so we decide that we will move on to a smaller location. So we do a bit of shopping for food and press on along the Camino up the hill out of town past the monastery and vinery at Irache. According to the guide book this is the place where there is a tap that delivers free wine to pilgrims, we find it, it is well sign posted with a webcam watching over the wall with two taps one labelled water and the other wine. Alas only the one works and it delivers water, we presume there must be a quota system and it has been exceeded, such is progress! By 1200h we have reached a small village Villamajor and decide that 20 miles is enough for the day although it is still cool and cloudy up here at 700m. This is a lovely little village which contains a superb church tower in the village, a castle way above on the hillside and a winery below in the valley. There is also a bar restaurant and a small hostel run by two volunteers one Spanish and one German. There is no charge but donations are accepted, we select two beds in a separate room, it is the corridor/bathroom, the bunkbed is 3 feet from the first shower cubicle, however no one will shower in the night and we can both snore with minimal disturbance to anyone else. Washing of clothes is done in a bowl outside on the roadside and there are drying lines up around the back of the church across the road. This is more like the Camino that has been written about. We meet a Danish woman at lunch in the bar (9€), she is walking the Camino from St Jean Pied de Port, she speaks good English some French and no Spanish, and works with immigrants to Denmark back home (they have 1000 per year). She is walking with two Spanish women neither speak English one speaks French, efforts to communicate cause great amusement on all sides. We are on the second shift for feeding in the bar and stand looking at other Pilgrims waiting for some of the 14 or so chairs to become vacant, dinner is pasta salad followed by meat and potato stew with bread and wine with ice cream to follow no longer hungry we return to our bunks for siesta. Monreal to Puenta la Reina. In order to avoid a 600m climb over a large massif the Aragonese Way takes a course north west around the edge of the high ground, generally skirting the edge of the cultivated land and the woods on the lower slope it loops around until it reaches Tiebas. We walked this part at first in the dark with head torches dodging the mud from last night’s rain and only managed to wander off route once in the dark which is near miraculous. The heat wave seems to have broken and even at 1130 when we reached Puenta la Reina having walked through a pleasantly fresh morning, it was only around 30 degrees. The route skirting the mountain although avoiding major ascents had a great deal of up and down as it hugged the flank of the Sierra de Alaiz. A couple of hours after seeing the lights of Pamplona at about 0630 we managed s coffee in Tiebas, most unexpected as most bars in Spain don’t open till 1000. An hour or so later we saw our first distant view of our day’s destination but it was another hour and a half after that we joined the main Camino Francais in Obanos on the outskirts of Puenta la Reina. Before this it had become obvious that we were reaching the more popular part of the route to Santiago as we met dozens of Spanish and other nationalities who were obviously walking a bit of the Camino for a day, no packs etc (we later found there is an organised system to sent luggage from one place to the next along the Camino). I fear that on leaving the Aragonese Way we may have seen the last of the Camino how it was 20 years or so ago, except possibly for the plains of Castille where few except the true pilgrims go and the land is so flat you go mad and start charging at windmills! Before joining the French route we encountered a truly lovely little church at Eunate out in the middle of nowhere, surrounded by its own arched outer walls and with the wafer thin marble in the windows replacing the glass, this is a common feature of most of the churches here and gives a beautiful pearly light within the arched domes. This church was used many centuries ago as the burial place for pilgrims. The joining of the ways at Obanos is marked by a modern thin crucifix in the square outside the church and an arch through which both routes pass. Puenta la Reina is a large town by standards round here, maybe not as quite big as Stourbridge (Tim’s home town)! We had a Pilgrim Menu for lunch at 9€ at one of the several Bar/Restaurants in town having first secured a bed at the second of three hostels in town. While wandering the town we met again for the third time a Frenchman named Patrick who is doing his own route a bit like us. Starting in the south of France he crossed the Pyrenees and wandered up the GR11 down the way from Jaca and now intends to catch a bus to get to the northern coastal route to Compostella. He walks slowly with a bad foot from a motorbike accident but walks most of the day arriving late at hostels and pressing on in a somewhat disorganised fashion. We gave him a couple of peaches yesterday bought from the van in Monreal that came round before he got there and he insisted on buying coffee for us in town when we met. He may be in Compostella at the same time as us, or Finisterre. Tim feels we are destined to meet again in spite of the different routes. Maybe the Camino is getting to him! Another great days walking, but first the things we forgot yesterday. After the church of St James we had a walk about town and were directed to the garage of an 84 year old Spaniard Nicolas Navallas Martiz who makes models of the churches and other buildings in Sanguesa (in fact the whole town!) from lead and copper, he’s been on TV he proudly told us, see www.edinecto.tve.es. Then he showed us the collection of postcards from people all over the world who had completed the Camino and sent him postcards from back home, possibly the most unlikely being from Iran. All in all good value even if we did not understand a word of it. The skies were darkening and the wind got up and we were having dinner in a bar in town when the rain came down, it was not as heavy as we expected but very flamboyant with thunder and lightening, very Spanish. Temperatures dropped a bit from the heat of the afternoon as we went to bed with an early morning to follow. Up at 0515 and out in the dark along the road to the chemical works (responsible for the smell in the afternoon we had blamed the river or each other) and then steeply up hill to another village, after that it was walking on cart tracks and fields through the steadily lightening landscape of dried and blooming flowers and stubble fields in the early light. The rain the previous night had left mud puddles some of which had tracks we were later told were wild pig. Around 0800 we had breakfast of half of the loaf bought yesterday and cheese, no morning coffee since entering Spain except one restaurant we passed about 10am one morning. After a steady ascent over 10-14km of 400m we saw the valley below full of clouds as dawn was breaking, we had not expected a second display like this since leaving the High Pyrenees. A steady descent into the valley of the river Elorz which flows to Pamplona (the Aragon having disappeared to the south) brought us to a spring in the limestone riverside at Salinas de Ibargoiti and then steadily down the valley finishing through a welcome wood to Monreal at the foot of the hill. This village is billed in our information as having “All Facilities”. It does have an ATM , a hostel and a bar but no shops except a pharmacy. In France there would be at least a Funeral Directors and a hairdresser, equally useless for our purposes. There was a man selling peaches from his van (we bought 10) and we are told there is a bread van twice a day (we missed it). Have had a slice of Chorizo Spanish omelette in the bar for lunch and like the rest of the hostel of 20+ beds (including the Spanish) we wait to see what will happen. On top of the hill are the ruins of a citadel with a faded notice, a wild boar (disturbed and crashed off), and a host of Zebra Swallowtail butterflies. After a second good meal post siesta, there was little to do but complete the blog and go to bed, the whole dormitory agreed that 0530 was a good start time so we could get up with the lights on instead of creeping round in the dark tripping on things. So we set of down the rocky path out of Ruesta by head torch light at 0530 after crossing the stream we climbed up a moderate incline for a bit over an hour rising 250m to a ridge before descending on rough tracks and finally just before Undues de Lerda the remains of an old Roman road. As we reached the village at 0845 after 12km the only shop and bar was closed so we pressed on stopping to eat from our picnic provided by the hostel in lieu of breakfast. A long boring stretch on road during which we saw our first olive tree, (a clear sign of climate and decreasing altitude) was followed by more rough tracks on which we moved over the border from Aragon to Navarre and which brought us to the outskirts of Sanguesa around 1100. While wondering whether to move on to the next place on our Camino route or stop here we lost our place in the queue for two of the 14 beds in the pilgrim hostel. We then found that our possible next stop is no longer on the route and the next stop on the route is 29km! Just a bit too far in a Spanish heat wave so we end up in a somewhat more expensive Touristico Rurale at 56€ for two in a double room instead of 8€ each. But we got in at 1300 and had somewhere to siesta, this is a necessity in temperatures well over 35 degC. Before siesta we found time to visit the church in town dedicated to St James, (he was there above the door standing on his scallop shell with a pilgrim on each side). This church dates from the 14th century when the overlord decided the populace needed another church. The original fortified church on the bank of the river was built at the founding of the town in the 12th century. This was placed here deliberately for the pilgrim way as a resting and trading point after crossing the Pyrenees and descending from Jaca.